New idea contest on Desall.com: Manifattura Falomo and Desall invite you to design a new system to help consumers choose the most suitable mattress according to their needs inside the points of sale. For over 50 years our mission has been to promote the culture of “healthy sleep”, making high quality mattresses, pillows and beds. 100% Made in Italy. 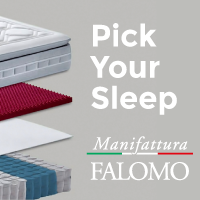 Manifattura Falomo invites you to design a new system for enabling the final user to choose the most appropriate mattress according to her/his need, based on two parameters, the body shape and the sleeping position (on the back, on the stomach, on the side). The primary aim of the contest is to find a modality, a system or a tool (either physical or digital) mainly based on a coding system – of your conception – able to help the consumer choose the most appropriate mattress, based on two parameters: body shape and sleeping position. Selection flow: through the selection system the user will be invited to set two parameters, body shape and sleeping position. The body shape will be one of the selection parameters and shall be associated with an identification element (e.g. colour, icon, writing, etc. ), that will also be applied on the mattress. The other parameter that the user shall set is the preferred sleeping position (on the back, on the stomach, on the side) that will be associated with another identification element (e.g. colour, icon, writing, etc.). At the end of the selection phase, the user will receive a visual output that will also be found on the mattress (see MATTRESS IDENTIFICATION paragraph) and will enable her/him to visually identify the most appropriate product according to her/his needs. - female body, with large hips. Sleeping positions: another parameter to help the user understand what mattress best suits her/his needs is the sleeping position (on the back, on the stomach or on the side). You are thus invited to conceive a representation modality of the various positions and a ranking system (comfort degree) that will be applied also on the mattress, to help the user understand which one best meets her/his needs. At your discretion, you might use this parameter also during the selection phase. -	Textured sewing pattern (see Item 6 – Material files). As a typical scenario, take into consideration that the mattress will suit only one body shape but may fit several sleeping positions. Accordingly, you are invited to design a visual ranking system to apply on the mattress indicating the comfort index for each sleeping position (on the back, on the stomach or on the side). Ultimately, the identification elements might be ideally reproduced also on other promotional elements inside the point of sale, including floor displays and other communication materials. Display concepts (nice to have): designers suggesting an innovative way to display a selection of mattresses chosen by the retailer will be particularly welcomed. In particular, the retail will showcase only sections of the mattresses to show the technology employed inside. You are free to propose display concepts, representing a distinctive trait for the brand, without necessarily using a physical structure (you may opt for a virtual modality, using screens, projectors or other). Alternatively, you may propose a restyle of the current display. Refer to the Material files for an example of current display. Materials: the selection system and the display can employ the following materials: wood, metal, polymethyl methacrylate (PMMA), cardboard, etc. The selection system might also use the technologies specified above for the display. Where to use: the system you propose shall be employed inside various points of sales and authorised showrooms, in specific areas dedicated to the brand. For some examples of display areas, please refer to the Material files. Style: you are invited to use a clean and minimal style, in line with the brand of Manifattura Falomo, with a special attention to detail, a typical feature associated with the Made in Italy values that the brand represents. Colours: you are free to use the colours that better suit your proposal, either using the colours of the brand or other colours at your discretion. Values to convey: your system shall convey the values that made Manifattura Falomo a benchmark brand for the industry, a promoter of the healthy sleep and with a special attention to personal care. For better understanding the company culture and their all-around research on the wellbeing of the person, you may refer to their blog . Customer typology: the average customer of the Manifattura Falomo mattresses is made of a female public aged between 35 and 65 years. The system you propose and the possible technologies you are going to employ for facilitating the selection of the most appropriate product, shall be designed with the user experience of the customer inside the point of sale at the core of your attention. Deliverables: upload all the images that better present your projects (rendering, descriptions, CAD files, etc.). Projects showing the product placed inside the retail setting will be appreciated. If you use symbols, icons, app screens or other elements, you are invited to include them inside a .ZIP archive to attach from the upload page. Participation is free of charge and open to designers and creative talents of any nationality aged 18 years or older. Participants can present one or more projects, but only the projects published on the www.desall.com web site, via the upload page related to “Pick Your Sleep” will be accepted. The selection of the winner by Manifattura Falomo will be the result of an unquestionable evaluation and it will take into account originality, feasibility and consistency with the brief presented. For the duration of the option right, the Sponsor offers an extra chance to all participants setting a fee of Euro 1,500,00= (one-thousand-five-hundred/00) for the purchase of the license for the economical exploitation of the projects not-acknowledged as the winning proposals. Do you want to stay updated about "Pick Your Sleep"?